This week I was looking for something a little different and found a Kolsch from Cowbell Brewery in Blyth. Ontario, called Absent Landlord. This is a fairly new brewery on the craft scene and currently is being contract brewed out of a Hamilton brewery. 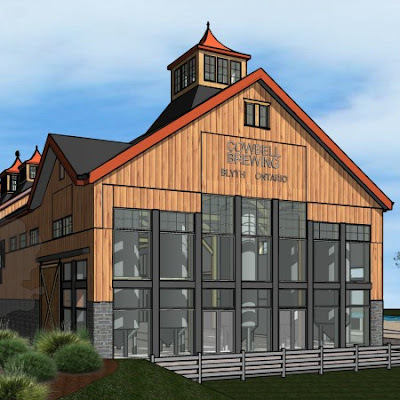 The new brewery and restaurant is currently being built in town, not just to brew beer but to be also be a tourist attraction for the town. The architect concept picture is below. Their name of their first beer reflects the town's founding and history. Originally the town was founded under the name Drummond, in 1851, perhaps after Sir Gordon Drummond, the first Canadian born officer to command both the military (War of 1812) and civil governments. He died an hour and a half south to the south in London, Ontario. In 1855, the entire town was bought outright, sight unseen by Henry Blyth Esq. from across the ocean in England. It seems that Henry never made it across the ocean to see the town he owned, that also heralded his name. Thus the name of the beer, Absent Landlord. It pours a cloudy, light golden colour with a white head, which took some time in disappearing. I could not detect any aroma, as I am a little stuffed up. Not too stuffed up, mind you, to notice the flavour. Absent Landlord starts off with an excellent tartness but finishes more sour than tart, if that makes any sense. It's a beer I really enjoyed. I bought two to try but wish now that I had bought more as it is delicious and a little different. I do know one thing for sure ... I will be buying more!